Welcome to Fish Window Cleaning Omaha, your locally owned and operated window cleaning experts for the Omaha Metro area! Fish Window Cleaning services the entire Omaha and Council Bluffs metro area including: Omaha, Bellevue, Papillion, Ralston, Elkhorn, Bennington, La Vista, Valley, Gretna, Council Bluffs, Carter Lake, and Waterloo. Fish Window Cleaning was voted Best of Omaha in Omaha's Business-to-Business Magazine!! We are extremely proud and honored to be recognized as the best by our many loyal customers. You’re busy, we understand that. At Fish Window Cleaning, our number one priority is making sure that getting your windows washed is effortless from start to finish. From a no hassle, free detailed estimate, to scheduling, to the cleaning of your windows, our window cleaners are professional, courteous and efficient. We’re not just a window cleaning company. We provide a variety of services for you to check off your to-do list: ceiling fan cleaning, skylights, chandelier and light fixture cleaning. If you are interested in any of these services be sure to mention them when you call to schedule your free estimate and we will include them separately in your estimate! Our professional window cleaners take special care to ensure your home is left just as we found it – except for the shiny clean windows, of course! We wear fresh shoe covers as we enter your home and use cloth pads under each window to protect your carpet and wood flooring. We can also provide you with the peace of mind that your job is being completed by licensed, bonded, and insured professional window cleaners. You work hard to give your business the best impression to your customers. Enhance the look of your business with the polished, professional look of clean windows! We provide window washing and awning cleaning from weekly to annually, tailoring our services to the needs of your business. We also offer hard water stain removal, construction clean up and window paint removal. 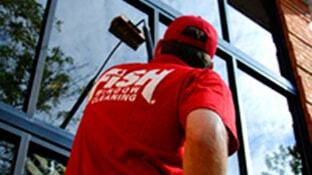 Regardless of your needs or budget, Fish Window Cleaning can put together a schedule for you. When you choose FISH, your will have peace of mind that your job will be completed by licensed, bonded and insured window cleaning professionals. We’ve led the industry with a premiere safety program to ensure the protection of our customers and our cleaners. Your company will also have the benefit of custom scheduling plans, and we accept all major credit cards. Fish Window Cleaning pledges to provide superior service to each of our customers. We are committed to customer satisfaction. If it’s not right, we’ll make it right. If your world isn’t bright, neither is ours. It will be our pleasure to add you to our list of satisfied customers. Select the "Free-Estimate" icon on our website!